Many observers from both scientific and traditional persuasions also find faculties of a cognitive sentience to suffuse and distinguish an innately animate, personified universe. Their appearance is seen to infer a primordial, original mind from which arises the stratified emergence of knowing self-awareness. More apropos sources may be found in Part VI, Conscious Knowledge. 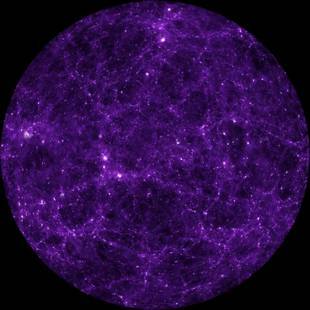 This image is from a Hubble Space Telescope Science Institute site: http://hubblesource.stsci.edu/sources/video/dome/ and is a Planetarium visualization of a cosmic structural web of galaxies. Aerts, Diederik, et al. From Quantum Axiomatics to Quantum Conceptuality. arXiv:1805.12122. As we gather frontier articles as this from a worldwide repository, we note that it has not yet dawned that into the 21st century, a whole scale revision of quantum phenomena has arisen in contrast to past hardly intelligible arcana. Here Free University of Brussels and University of Leicester (Sandro Sozzo) “interdisciplinary physicists” propose an axiomatic (self-evident) view, which can then be traced all the way to human acumen (quanthuman). As the second quote alludes, the paper is an example of how scientific scholars are coming to explain and realize that the natural cosmos (as long intimated) does deeply possess its own mindfulness and ascendant cognizance. See also Modelling Human Decision-Making: An Overview of the Brussels Quantum Approach by Diederik aerts, et al at 1807.11035. Annila, Arto. On the Character of Consciousness. Frontiers in Systems Neuroscience. Online March, 2016. The University of Helsinki physicist draws upon his non-equilibrium thermodynamic theories (search), along with statistical mechanics, to show how cognitive sentience has an intrinsic, natural essence which then arises in kind and content through nature’s evolutionary transitional stages. Arsiwalla, Xerxes, et al. The Morphospace of Consciousness. arXiv:1705.11190. In an intricate article, a team from the Universitat Pompeu Fabra, Barcelona, including Paul Verschure, consider several degrees, substrates and features of sentient, practical awareness such as autonomous, computational, group social, and 3D continuums. See also Spectral Modes of Network Dynamics Reveal Increased Information Complexity Near Criticality by this group at arXiv:1707.01446. Baluska, Frankisek and Michael Levin. On Having No Head: Cognition throughout Biological Systems. Frontiers in Psychology. Vol 7/Art. 902, 2016. University of Bonn and Tufts University biologists contend that as an increasing number of studies find an active intelligence in place for invertebrates, cells, microbe, and plants, which do not have a brain-like capacity, nature seems suffused with an universal, independent cognizance. The presence of archetypal interconnective networks everywhere, which are similar to neural architectures, is a main basis. A behavioral scale across life’s evolution is then sketched from randomness to more purposeful, teleological feedback, predictive skills, onto aware self-reference. Another graphic depicts Tiers of Biological Cognition from genomes, cytoskeletons, nervous systems, tissue organs, onto whole organisms, and social groups. See also From Neural and Social Cooperation to the Global Emergence of Cognition in Frontiers in Bioengineering and Biotechnology, search Paolo Grigolini. Might an organic developmental cosmos then be broached that proceeds to learn, think, remember, gain knowledge, so as to discover and continue her/his self? Barron, Andrew and Colin Klein. What Insects can Tell us about the Origins of Consciousness. Proceedings of the National Academy of Sciences. 113/4900, 2016. In a paper edited by Michael Gazzaniga, Macquarie University, Sydney, cognitive biologists reach a similar conclusion as Todd Feinberg and Jon Mallatt’s The Ancient Origins of Consciousness (below) that a degree of informed sentience appears even at evolutionary life’s earliest stages. From these initial stirrings, a relative mental awareness and acumen manifests and arises with creaturely somatic and neural complexity to we peoples who are able retrospectively to learn all this. Baruss, Imants. Beyond Scientific Materialism. Journal of Consciousness Studies. 17/7-8, 2010. A King’s University College, Canada, psychologist further plumbs quantum domains as an approach to discern a primordial mindfulness in addition to, and serving to inspire ascendant explicate matter. Bronfman, Zohar, et al. The Evolutionary Origins of Consciousness. Journal of Consciousness Studies. 23/9-10, 2016. With Simona Ginsburg and Eva Jablonka, Israeli philosophers conceive a deepest penchant for aware life for continuing education as a means to evolve and emerge. If once again this quality and pursuit is paramount, then may we muse over a (self) Learning Universe. Bruntrup, Godehard and Ludwig Jaskolla, eds. Panpsychism: Contemporary Perspectives. Oxford: Oxford University Press, 2017. Munich School of Philosophy professors collect the latest realizations and admissions that in some real way this Earthly and cosmic evolutionary milieu ascends from and is suffused by a mindful essence. Chapters consider panprotopsychism, cosmopsychism, emergence, consciousness, monism, dualism, and idealism by scholars such as David Chalmers and Brian McLaughlin. See also Consciousness and Fundamental Reality by Philip Goff (Oxford, 2017) for a concurrent view. Busemeyer, Jerome and Peter Bruza. Quantum Models of Cognition and Decision. Cambridge: Cambridge University Press, 2012. Indiana University and Queensland University of Technology physicists and psychologists contribute to growing realizations that subatomic phenomena can be found in formative effect at all macro phases, in this case mental processes. A good part of this budding quantum-classical synthesis is a clarification of aspects such as contextuality, interference, entanglement, and so on. And as this merger goes on, quantum realms become better appreciated through familiar complex system theories. See also Applying Quantum Principles to Psychology by Busemeyer, et al at arXiv:1405.6427. Busemeyer, Jerome, et al. Applying Quantum Principles to Psychology. arXiv:1405.6427. Busemeyer, Indiana University, with Zheng Wang, Ohio State University, and Andrei Khrennikov and Irina Basieva, Linnaeus University, Sweden, continue to survey the actual presence of subatomic processes in our cerebral and behavioral activities. See also a special issue of the Journal of Mathematical Psychology (53/5, 2013) on Quantum Cognition with papers by Diederik Aerts, Liane Gabora, Kirsty Kitto, and Emmanuel Haven. Butler, Ann. Hallmarks of Consciousness. Lopez-Larrea, Carlos, ed. Sensing in Nature. Dordrecht: Springer, 2012. The George Mason University neuroscientist contributes to waxing affirmations of a stratified ascent of this premium evolutionary faculty. A continuum of consciousness, as long intimated, does indeed arise and flow from a universal essence to observant, reflective peoples. By the “seemingly less complex behaviors of reptiles and amphibians, complex behavior of birds, behavioral abilities of teleost fishes,” unto later mammals, primates, hominids and homo sapiens, regnant life elaborates its cerebral anatomy, physiology, and cognitive, informed awareness. These are “Behavioral and Information Hallmarks,” by way of the Tononi/Koch theory of a “somatosensory” vector toward reflective self identity.